Best for parents with 4- 18 months old. Interested in a Late Spring/ Summer Playgroup? We’d love to offer one! Please fill out this wait list with your availability and we’ll get back to you! We’re aiming for a new playgroup to start in May. 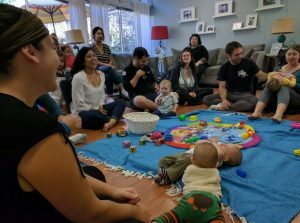 Our six-week Baby Sign Language playgroup is a fun opportunity for parents to build their signing vocabulary with themes like mealtime, animals, colors, family, safety, bedtime, and more. Two different playgroup series — Playgroup Boom! and Playgroup Zoom! — are offered for an increased opportunity to practice and build your signing vocabulary. No need to take them in order – start with either Zoom or Boom. Babies are welcome to engage in class or with each other, or parents may come on their own if you feel you will learn the signs better that way. This is because babies will do the bulk of their learning through being exposed to signs by their caregivers in their daily routines, rather than in a class once a week, just like with spoken language. The research shows that babies exposed to signs by the time they are 5-6 months old will begin to absorb them as language and then may begin to sign back around 8-10 months of age. For parents, learning in the newborn stage or earlier gives you enough time to learn, and then communicate.